The Sea Dreamer Project: That's forever! 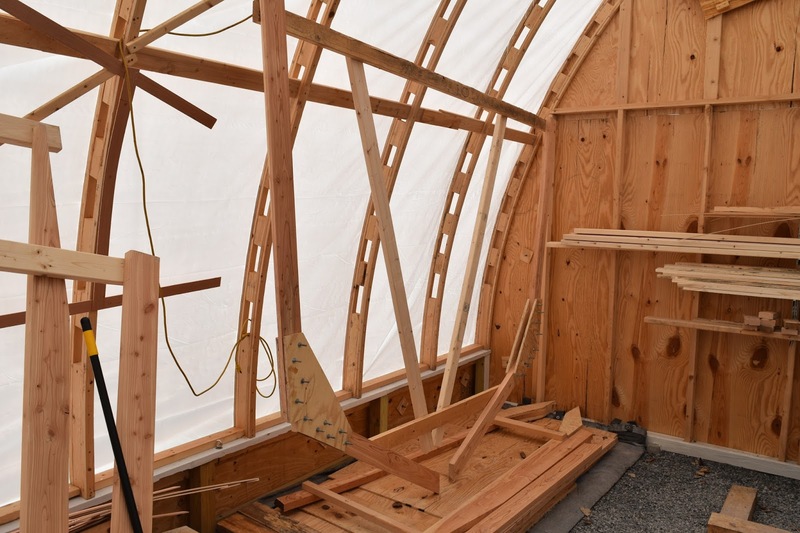 Wooden boat frame construction. Spring has sprung and with the warmer temperatures it's perfect weather for glue! The first five stations we lofted out are now complete. Chines cut, glued, bolted and done, they are now permanent. 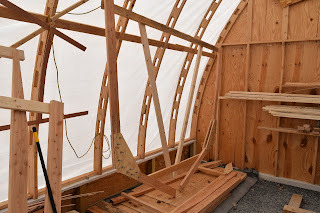 I stressed for weeks over whether to cut the chine notch on the table or after the frames were installed on the keel. 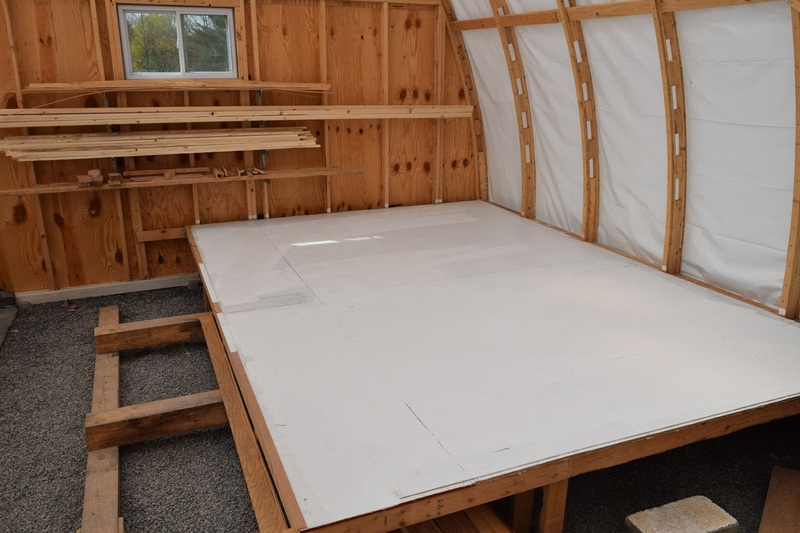 George Buehler recommends doing it on the table but other Duck blogs I have read have recommended doing it once they are installed. One builder said after he cut them on the table the chine notches did not line up once installed on the keel. It's easy to understand why the notch may not line up when you think about it. The plans indicate that the chine notch is 2 1/4" deep (3 layers of 3/4" material laminated together) 2" on the outside of the notch and 3 1/4" on the inside. However, it is impossible to have these 3 dimensions exactly at each station. The angle between the sides and bottom is constantly changing from station to station and no two frames are the same. The only measurement that is constant for each station is the thickness of the chine log. In my mind you have to be flexible with the other two measurements to ensure they line up. With that in mind I created a simple plywood jig taking into account the two dimension I knew the notch could not exceed. The inside 3 1/4" dimension and the 2 1/4" depth are the important ones. The 2" outside dimension is going to be different for each station. The jig is simply to small pieces glued together 2 1/4" deep by 3 1/4" long in the shape of an "L". When placed on the station you simply line up the depth side flush with the outside of the frame while simultaneously aligning the 3 1/4" height side of the jig flush with the bottom frame. This ensures that the notch will not exceed the maximum dimensions of the laminated chine log stock. The outside of the lamination will be proud of the bottom frame but that's a good thing. 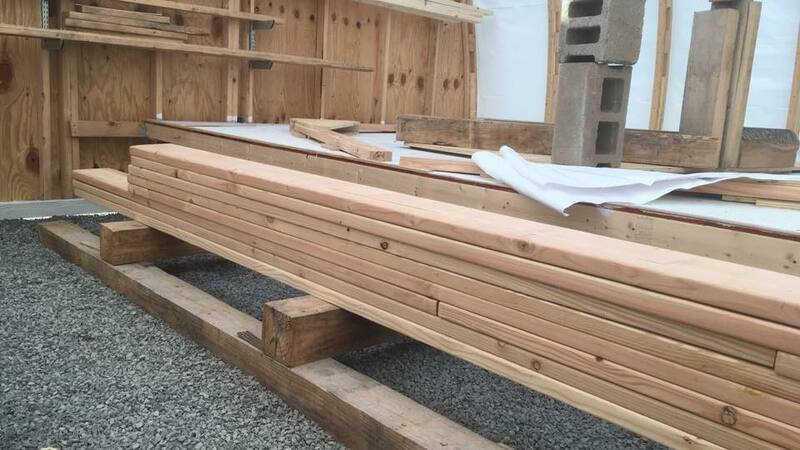 This will allow extra material to be faired off later to align perfectly with the bottom. 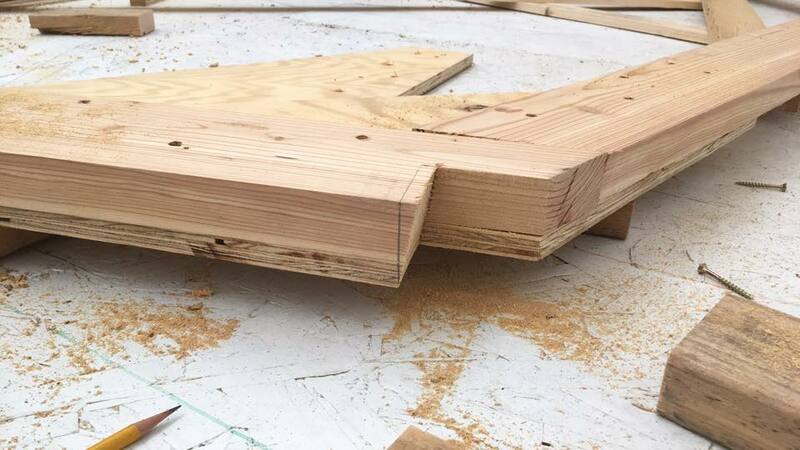 The jig is the L shaped pieces of plywood in the center of this picture. With the jig in position it's a simple matter of tracing the shape out on to the frame. Once marked I used the jig saw with a long blade to cut it out. I cut out each notch at the same angle of the corresponding frame bevel. These will need to be fine tuned at each station upon installation but my goal is to take as much "meat" out of the notch as I can when it's easiest to work on the frames. To match the angle of the bevel I simply laid my jigsaw base on the side of the corresponding piece I was cutting being careful to establish the angle with the saw in the same direction the cut will be made. I then adjusted the angle of the blade until it matched bevel of the frame piece. I made the cuts a few different ways before I found what worked best. 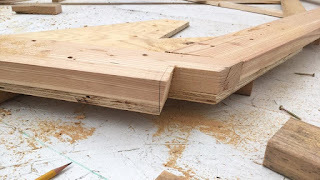 Being mindful that the angle of the saw blade would change the dimensions of the notch, you need to be careful to cut on the correct side of the line. 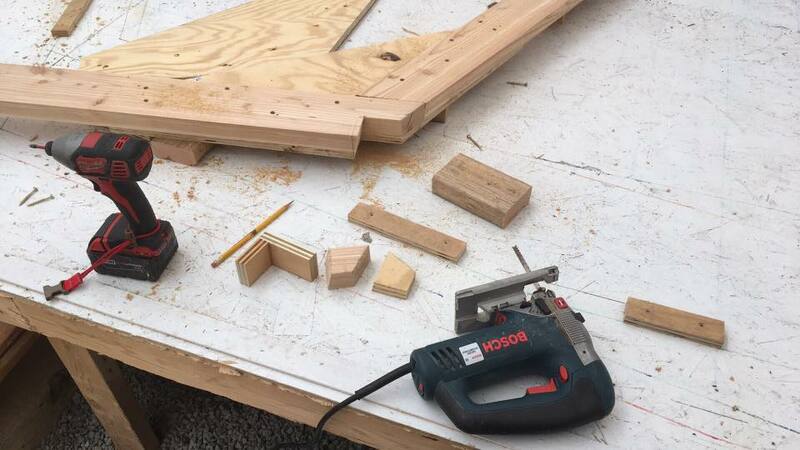 You don't want to make the cut larger than the jig layout. What I found to work best was cutting with both gussets in place and the wide side of the frame face down on the table. When you lay your jig on the narrow side and adjust the saw blade angle it ensures that the cut never exceeds the dimensions of the jig. Once I had my head straight understanding all these angles the cutting of the notches went quickly. I struggle with the mathematics of woodworking, in particular geometry. It takes me a little longer than the average person to have a good understanding of what is happening. Next up was drilling the bolt holes, gluing the gussets and installing the bolts. Nothing complicated here besides being careful of where the bolts go. Each frame receives 20 bolts, 10 on each side, 5 per piece. The hardest part was deciding which glue to use. Once again I stressed over this detail. Epoxy, Rescirnol, Plastic resin or Titebond III were all options. After reading extensively I was leaning toward TBIII. Then the builder of the Diesel Duck, Pelagic, commented on one of my posts of how he used gallons of TBIII in his build. 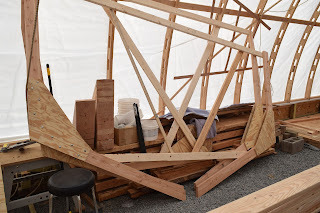 If you've ever seen how beautiful his boat came out (pictures HERE) I was sold on TBIII. Ultimately my choices came down to plastic resin and TBIII. I know that TBIII is not a structural adhesive and that plastic resin is. 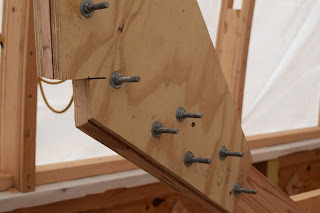 However I am not relying on the glue to hold the joint together, that's what the bolts are for. The glue is the suspenders in the belt and suspenders approach I am taking with this build. Additionally plastic resin glue requires very specific conditions and temperatures in order to cure properly. If not cured properly the glue fails terribly. I read many stories of things going bad with this adhesive. Since I could not guarantee the protracted time periods to meet the conditions that plastic resin requires I went with TBIII. While more expensive than plastic resin, TBIII is premixed and easier and quicker to apply. It's rated as waterproof, just as plastic resin, yet it will cure down to around 45 degrees. It's the glue I used on the boat shed I'm building in and that structure survived 81 MPH winds with no damage. I marked my holes with a marker then drilled them out. I then removed the screws from the gusset and applied the glue. I reinstalled the gussets and screws and then flipped the frame over and did the same thing on the other side. I then hammered through all the 5/16" bolts and applied washers and nuts. I tightened them down to the point that the wood fibers began to compress. 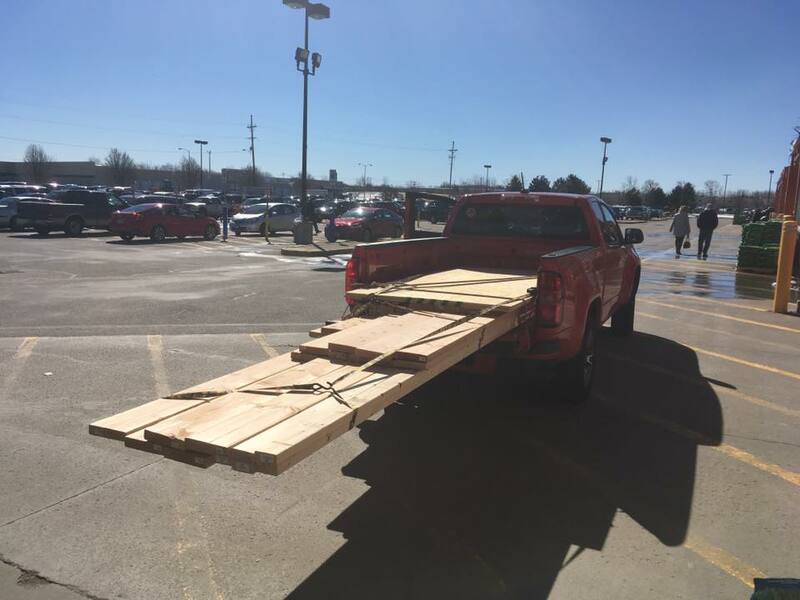 You don't want to crush the wood and cause it to split. That process was repeated for all the frames and once completed they were stacked along the side of the boat shed. I then put a fresh coat of paint on the framing table in preparation of the next round of frame lofting. 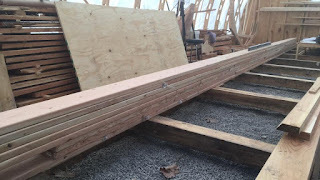 Finally, we purchased the remainder of the lumber required for the keel. I ended up cashing in my credit card points that I didn't even know I had from 10 years of using the same card. This resulted in over $400 in home depot gift cards that we used to buy Douglas Fir 2x8's in various lengths. It was quite a sight to see those sixteen footers hanging out the back of the truck be we got them home safe and sound. 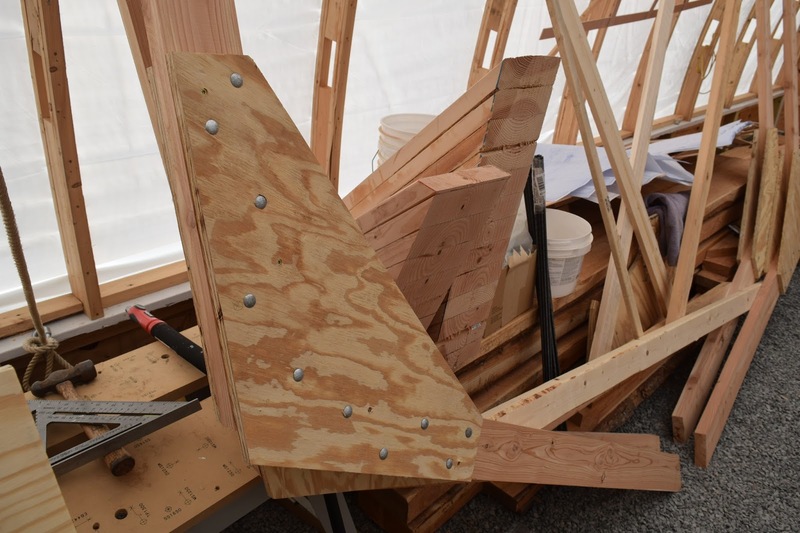 Then just because I wanted to see what it looked like I stacked them up in the boat shed in the form of the lower portion of the keel. It's massive and this is just the first part too! There is still another 9 inches to go that will be comprised of the larch we bought a few months ago. 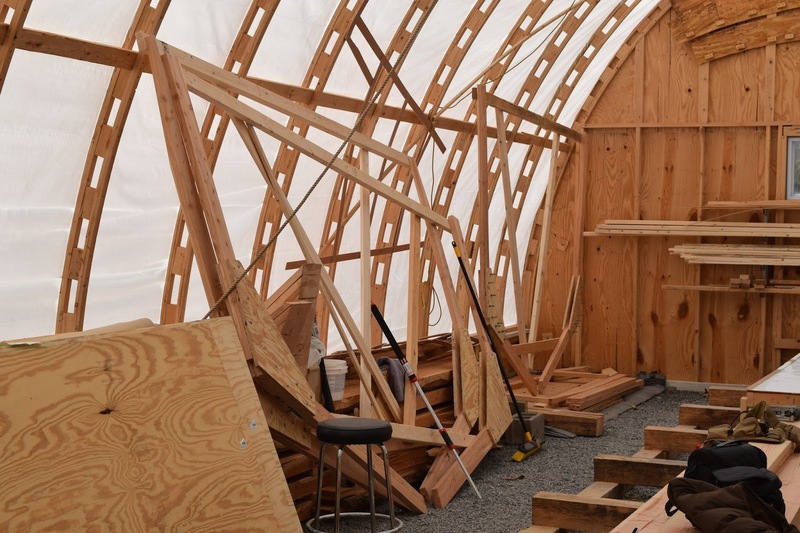 I wanted to use the rot resistant larch as we got into the inside of the boat where the wood will be going through regular wet/dry cycles. 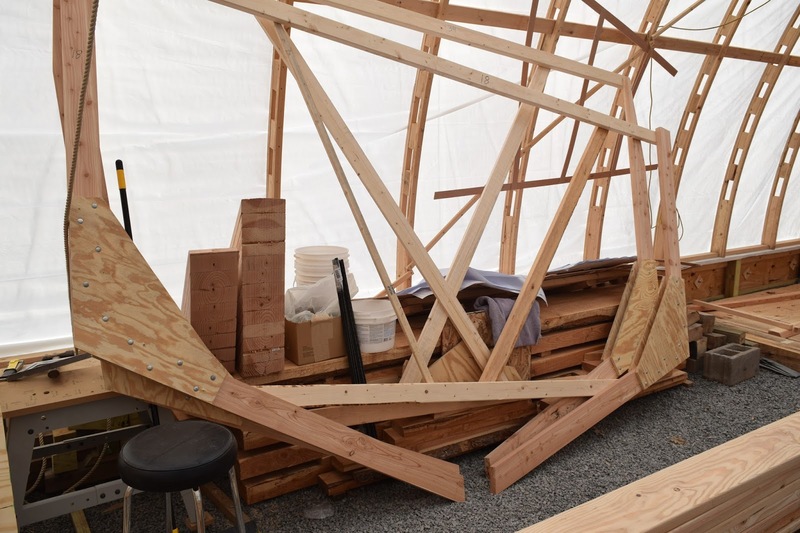 I'm not worried about the submerged part of the keel rotting as it will not be exposed to the air and will be encapsulated in epoxy and fiberglass cloth. Now it's on to lofting out the next batch of frames and repeating the process. 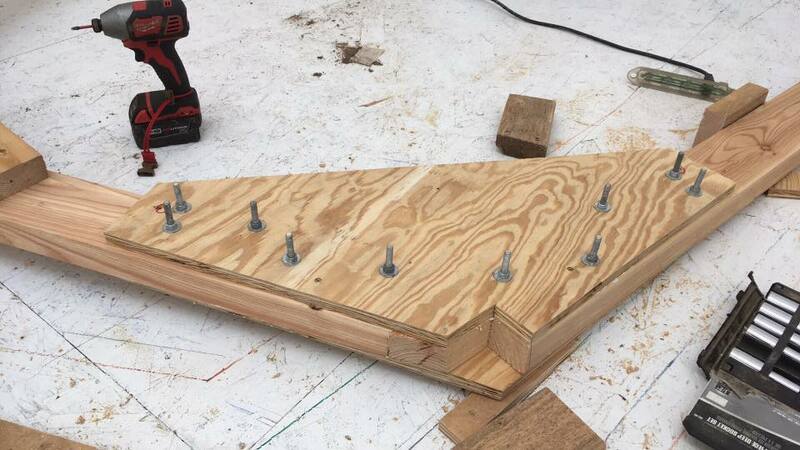 The only difference is that we can apply the glue and bolts as we go. That is going to be nice because the less you have to move these frames back and forth from the table, the better. They are fairly heavy but it's their size that makes them difficult to move around. Check out our Facebook page if you want to follow along in real time on our work days. You can follow the link at the top or click HERE. If you want to watch us in action check out our YouTube CHANNEL. Thanks for following along and good luck on your project, go create something! Outstanding! That's quite a hefty keel...I can't imagine you'll get too thrown around out on the water. What kind of time are you able to devote to the project? Is it a full time project? Thanks Ryan. She's designed to cross oceans so I'm hoping she'll be solid as a rock. I've been asked about the time line but I don't really know. I'm still working full time with teenage children so this is definitely a part time project. I would love to say 5 to 7 years but who knows. I think things are going to get even more expensive as we get towards the advanced stages when things like tanks, engines and systems will slow us down a bit. Having a great time so far though and we are building pay check to pay check as George describes in his book. This is very doable for the average person. Thanks Tanveer, glad you are following along. Can I ask where you're from? I'm really enjoying connecting with like minded people from all over the world. After reading out this blog I got to know about the exect info on Wooden boat frame construction. 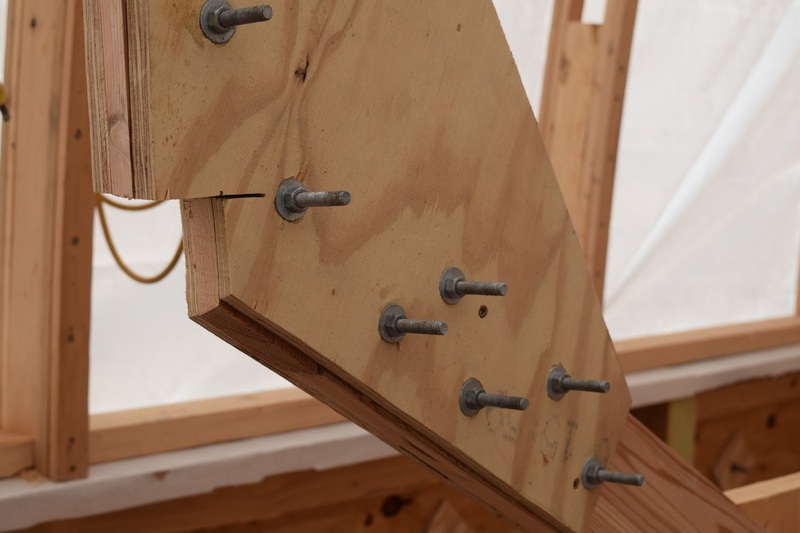 Actually there was some confusion about the constructions of wooden bot on my mind but its clear right now by getting your steps by steps information. Thanks for this nice sharing.